Originally published under the title, "4 Jews Killed in Paris Attack Buried in Israel." The families of all four victims killed in the terror attack on a kosher grocery in Paris earlier this month chose to bury their loved ones in Israel. Under a cloudless Jerusalem sky, a crowd of thousands gathered at the cemetery at Givat Shaul on Tuesday [January13], to bury the four Jews murdered at the Hyper Cacher in Paris. Yoav Hattab, Yohan Cohen, Philippe Braham, and Francois-Michel Saada were laid to rest in Har Hamenuhot, on the approach to Jerusalem from the west. The families chose to make their funerals an act of defiance, firmly remembering that these lives were robbed by an Islamist murderer, because the four men were Jewish. The form this defiance took was a re-statement of identity—a joint funeral in Israel, in a place festooned with blue and white Israeli flags. The killer, Amedy Coulibaly, had been quite clear regarding the purpose of his attack on the supermarket. "You are a Jew, you will die," he reportedly yelled at the owner of the store as he entered. While much of the media coverage of last week's Islamist killing spree appears to prefer to obscure or ignore the anti-Semitic message, the families of those murdered in the Hyper Cacher chose to listen to it. On Tuesday, at the funerals of their loved ones, they issued their reply. Har HaMenuhot is as safe from the hands of enemies as a Jewish resting place can conceivably be. The location of the funerals was political in another way too. They were originally planned to be held at the beautiful, ancient Jewish cemetery on the Mount of Olives. But the Jewish graves in that cemetery, situated close to the Old City, have been the target of vandalism by Arab youths in recent months. Perhaps the families were concerned that such a resting place might lead to further indignities being visited on these murdered ones, even after the great indignity of the fact of their murder. It's also possible that since the cemetery on the Mount of Olives is under Israeli control, the French government, and other governments who sent representatives to the funerals, conditioned their participation on the change of location. So Har HaMenuhot, as safe from the hands of enemies as a Jewish resting place can conceivably be, was chosen as the site. "This is just the beginning," said a woman I spoke with there, Linda Cohen. Originally from Paris, the 50-year-old Cohen came to live in Israel ten years ago. Speaking in rapid, fluent, and angry Hebrew, she said that "there are many more terrorists, and all of us think they are just preparing for the next attack." I asked her what this will lead to. "Among French Jews," she told me, "there is a saying: 'better to make aliya [immigrate to Israel] in a seat, on a plane, rather than running for your life." A young man carried a placard in French that read, "I am Charlie, I am a Jew. I am Israeli. I am French. And I have had enough!" Shalom Cohen Saban, 30, the Israeli born son of French immigrant parents, told me that he had come to the funerals "to support the Jews of France, in this testing time." And also, he continued, because a relative of his had worked with Yoav Hattab, on the Birthright program. Hattab, 22, was the son of the chief rabbi of Tunis, and had been in Israel just two weeks before his murder. 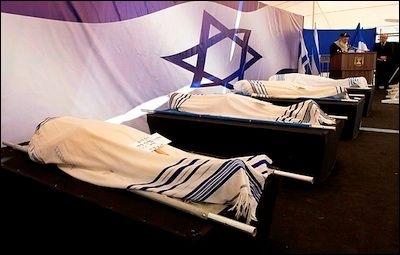 Eulogies from Israeli politicians were appropriate and even dignified, despite the fact that election season is upon us. There were eulogies from Israeli politicians, of course. Each of them—mercifully—were appropriate and even dignified, despite the fact that election season is upon us. Benjamin Netanyahu used a phrase from the early days of Zionism—"may we be comforted in the flourishing of our people and the building of our country." This was a phrase gently parodied by the poet Yehuda Amichai in one of his best poems "Seven Laments for the War Dead," in which the poet, himself a veteran of Israel's wars, expresses a quiet longing for the ending of the period of strife. Amichai passed away in 2000. It appears however, that the days of strife for the Jews, for Israel, and for the world beyond them will be with us for some time to come. "Dad was a man who put others before himself," Jonathan Saada, son of Francois-Michel Saada who was killed in the supermarket, told the assembled mourners. "He loved Israel. He always wanted to be here. And so he will be. He is here now and I am sure he is happy to be with you here." What was taking place in Har Hamenuhot was a Jewish, particularist response to the murder of four Jews. Nonetheless, it also carried a universal message: The business of physical resistance to those who wish to destroy us begins with a proud and unyielding recalling and assertion of our own identity, history, and values. Hopefully there are a few in tired and lost Europe who are listening. If there are not, the Jews of France at least have a clearly marked route to follow to Israel. Jonathan Spyer is a senior research fellow at the Global Research in International Affairs (GLORIA) Center and a fellow at the Middle East Forum. He is the author of The Transforming Fire: The Rise of the Israel-Islamist Conflict (Continuum, 2011).